Boil potatoes in salted water until soft, about 10 minutes. Drain and let cool. 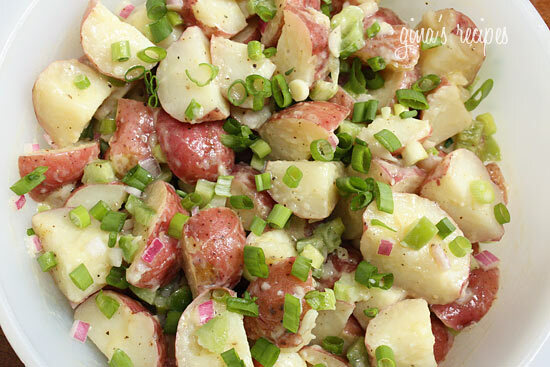 While the potatoes are boiling, combine red onion, green pepper, mustard, olive oil, vinegar and mayonnaise in a medium bowl and season with salt and pepper. Mix well and let the flavors marinate while the potatoes cook. Once the potatoes are done, add the green onions and additional salt and pepper to taste. Serve at room temperature or refrigerate until ready to serve. NOTES: This salad is quick and easy, and has a whole lot of flavor with hardly any fat. Really great with grilled burgers or chicken sausage.